This handy stand-up pencil pack is ideal for classrooms, studios, and galleries. 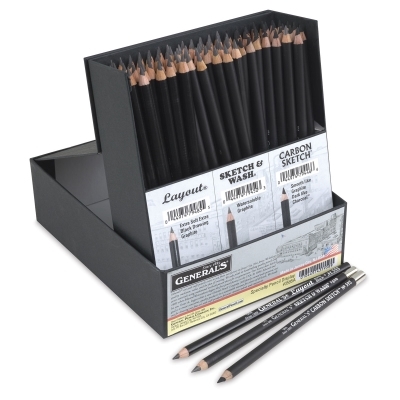 It holds 36 General's Layout Drawing Pencils, 36 Carbon Sketch Drawing Pencils, and 36 Sketch & Wash Watersoluble Graphite Drawing Pencils, for a wide variety of sketching and drawing techniques. Use the Layout Drawing Pencils for sketching and layout work. Equivalent to a very soft, round 6B pencil, they feature heavy black graphite. The Carbon Sketch Pencil is a fine pencil with a unique formula that combines the smoothness of graphite with the deep rich blacks of charcoal. Use it to lay down smooth, strong, jet-black lines for sketching and drawing. The Sketch & Wash Pencil is a soft, watersoluble, black graphite pencil that can be used dry — or apply water to create a wash effect. ® General's is a registered trademark of the General Pencil Company.® Layout is a registered trademark. ™ Carbon Sketch is a trademark. ® Sketch & Wash is a registered trademark.